Your chimney is one of the most substantial parts of your home. It can withstand natural disasters and high winds. It is definitely built to last as it literally has fire in a portion of it all winter long. Even a chimney that is constructed well can develop small issues though. With all the flames and smoke that occurs in a stack on a daily basis, it is critical to maintain your chimney. By doing so, you can catch minor problems before they develop into major issues. 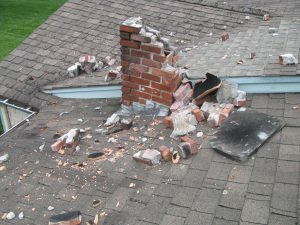 Continue reading to learn some of the most common masonry issues and how you can recognize them quickly in order to get chimney repairs completed before severe damage occurs. No one wants to notice water dripping down the fireplace or stains on the ceiling or walls. A wet smell can also indicate there is a water leak somewhere in your roofing, chimney, or fireplace. Chimney repairs will be needed if a water leak is involved. Water is difficult because it can be occurring for some time before you may notice the signs of the leakage. The leak itself could be due to improper installation of the chimney cap or flashing where rainwater is coming in through a hole. Make sure to call in a chimney specialist or experienced handyman immediately if you notice a leak or other signs of leaking such as a decrease in the efficiency of the fireplace or new drafts. Most times, your furnace should not have a smoky smell to it. There should be no smell at all. If you notice a smoky smell or even a smell of mildew, or decay, you need to be alert to potential issues with the interior of the masonry. Your chimney flue may need a good cleaning, especially if it has been a while since your last cleaning. It could also be that chimney repairs are required. You may have a water leak or need a new fireplace liner. Make sure to call a chimney sweep or professional as soon as possible. Spalling is crumbling of the brick and mortar as well as cracking and flaking. It can be caused by repeated weather as well as the passage of time. It is quite common in masonry, and it can be damaging if it is not repaired quickly. Usually, the brick and mortar need to be replaced with new, stronger mortar that will give your fireplace more durability and robustness. Painting of the new brick and mortar can occur, and no one will be the wiser that you had your masonry replaced. How does a leaning chimney happen overnight? Well, it does not. Usually, a leaning stack indicates a problem with the foundation that could have been going on for years, but you never noticed. It could have been leaning very subtly and then gotten worse to the point you are noticing the lean. If this is the case, you will also see cracking in the masonry or a large crack between your chimney and your house. This may need chimney repairs, so it is imperative to call a professional in immediately. A chimney and fireplace is a lovely addition to any home. It is one of the most substantial portions of your house and can add such flair and charm to a home. Chimneys can develop small issues though and need to be frequently maintained. This can be done by looking for chimney leaks, leaning, odors, and spalling and quickly repaired if problems are noted. By calling in a chimney professional, your chimney will be long lasting and will fill your home with much warmth for many years. Chimneys are a great addition to any house or home. They give off an appeal and make a home feel special. However, they need to be occasionally maintained to prevent a buildup of chemicals and to prevent fires from occurring. This can be done with a thorough cleaning of the chimney. 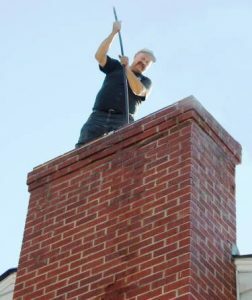 Since it is summer, it is a great time to have your chimney cleaned, as you will not need it with the hot temperatures of summer. Vents need to be cleaned depending on how often you use your fireplace. For most people who live in Cincinnati, you are using the chimney daily in the winter. With this type of use, it is recommended that you have your chimney cleaned annually at a minimum. Keep reading to learn more about the importance of chimney cleaning and how often you should be performing this crucial task. One of the most critical reasons to have roofing inspections and your chimney cleaned frequently is to improve the efficiency of the flue. When soot accumulates near and around the flue of the stack, there is a drop in ventilation. Ventilation is necessary to remove smoke and carbon monoxide that is produced when wood is burned. Too much accumulation of creosote will prevent the smoke and other chemicals from escaping. Left untouched, smoke will back up into all rooms of your home and can cause severe damage. Just like power washing leads to cleaner homes, chimney cleaning lead to spotless chimneys. This is important because a clean vent offers protection from fire. When wood is burned, not only does it produce smoke, but it also produces creosote, which is a dark, sticky substance that is quite flammable. The more creosote that is created and accumulates on your masonry, the more likely a fire is to break out. This is why it is of the utmost importance to schedule regular and frequent cleanings of your chimney. It is recommended to have your chimney cleaned when there is a residue of 1/8″ of soot accumulation that is visible inside your chimney or flue. When a fire is started and burned, it is not just wood and smoke that you have to be cognizant of. You also need to be aware of carbon monoxide. Carbon monoxide is a byproduct of fire. It is an unscented chemical that can be very harmful and destructive to humans and pets if too much exposure occurs. Signs and symptoms of carbon monoxide poisoning include nausea, headache, dizziness, and fatigue. It is imperative to have proper ventilation in your home and to have chimney cleaning and yearly inspections of your fireplace to check for carbon monoxide exposure. If you have a chimney that you infrequently use, it is essential for you to maintain and perform chimney cleaning. Not to prevent fires or carbon monoxide, but to prevent pests that can make your chimney their home. Wildlife such as squirrels, birds, and raccoons can find a way in your chimney and make it a cozy spot to live in. If they can get in the fireplace, they most likely can get into the rest of your home as well. A routine inspection and evaluation will allow you to see any critters that should not be there. By doing this annually, you will be able to catch any intruders before they make a nest or start storing food in your chimney. Chimneys need to be cleaned based on the amount of use. If you only turn it on once or twice a year, you could go a few years without cleaning, but if you use your chimney in the winter like most individuals in Ohio, you need to have it inspected, cleaned and maintained yearly. This will prevent carbon monoxide build up as well as fire prevention. You will also increase the efficiency of the flue with a chimney cleaning. Lastly, you can remove any pests such as squirrels or birds that have made your chimney their home. Make sure to call a chimney sweep or experienced local handyman to have your fireplace cleaned and inspected today.